At the Barefoot Bar in Placencia, Belize lively characters, expats and locals mingle among the brightly colored decor and the beachy vibe. The drinks are stiff, the staff is fun, and the music is live — don’t mind if we do. 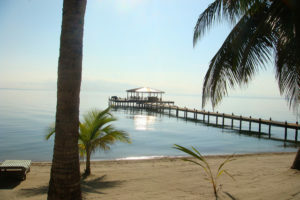 Placencia is a gorgeous peninsula located in Southern Belize. 16 miles of sandy beaches grace this lovely location. While it was a fishing village in colonial times, it’s now a major tourist attraction, offering kayaking, snorkeling, diving, saltwater fly fishing, whale shark watching, and even an annual Lobster Fest. No small part of Barefoot Bar’s popularity is their variety of tasty cocktails to choose from. Plus, you can drink these yummy concoctions right on the beach with the sand between your toes! We recommend a Hibiscus Sour or a Citrus Kamikaze Shot. And to give you a little sustenance for these stiff drinks, why not try their shrimp grilled cheese, the conch ceviche with corn chips, and coconut curry stir fry — Belizean comfort food at it’s best. Okay, if all that’s not enough, the Barefoot Bar also offers a beachy support group and “free advice” with your drink – in the unlikely chance you’re feeling depressed in paradise. And if you show up on a Friday, the joint turns into a nightclub, with local DJ’s curating great dance mixes. Let’s dance!